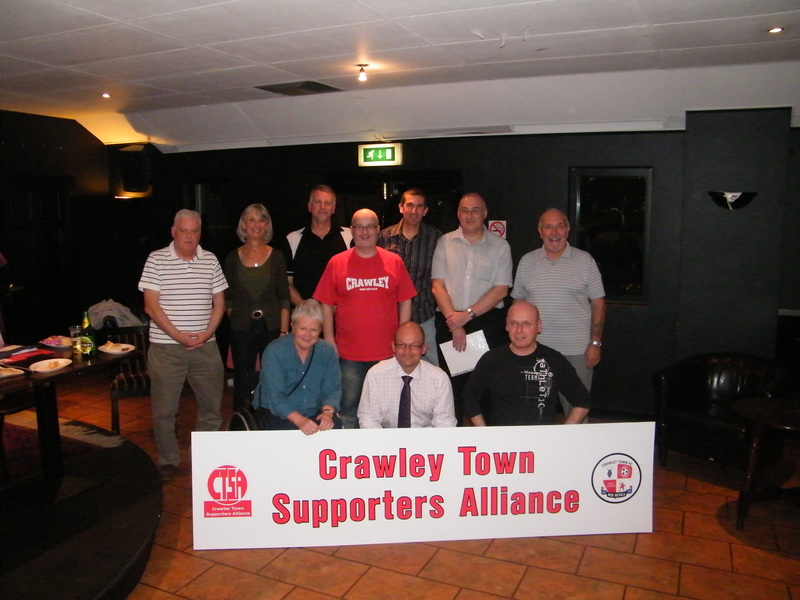 Around 60 Crawley Town Supporters Alliance members turned up in Redz Bar last evening (5th Oct) for a positive and entertaining EGM. Whilst the main feature of the evening was to officially vote in the new board other important matters were discussed. John Hooper (Community Initiatives) revealed to the meeting news about the Soccer in Schools initiative. School children in Crawley are receiving free Football Coaching from professional CTFC coaches funded by the CTSA. It is proving to be a popular idea and it is certainly engaging the with the local community (Watch out for more news on this soon). Guest speaker -and meeting Chair- Chief Executive Alan Williams said ‘We are very proud to have one supporters organisation. I want to thank the Interim board for the exceptional work they have done so far’. Alan then introduced the 12 members of the Interim Board, who read out their election statements and were duly voted in on block with a 100 % approval. Ian asked those present for a show of hands to confirm whether the membership would, in principle, be happy for CTSA funds to be released to sponsor the Centre of Excellence. Judging by the positive response it looks as though the CTSA and the new ‘Centre of Excellence’ will soon working together. A lively discussion ensued, and Simon answered a number of questions from the floor. During the final round up of members questions Alan revealed that the exciting new East Stand complete with 2151 covered seats should all be up and running by early February 2012. Ian then closed the meeting, thanking all present and members who couldn’t attend for their support, as well as thanking the Football Club, Silpa Winfield and local MP Henry Smith. The meeting was closed at 9pm, and all moved on to a buffet supplied by Redz Bar. Thanks Rhona! The minutes should be up here sometime next week, as there’s quite a lot to write up. We shall leave you with a Rogues Gallery! The newly elected board of the CTSA! John Hooper, Barbara Robinson, Owen Pickering, Paul Prendergast, Colin Bowman, Ian Townsend, Ken Blackmore . Front Row- Chris Cheshire, Simon Smith, Simon Hall. Missing- James Laraman (on holiday), Colin Lowes (at work)! All available for modelling work on request!